Preheat the oven to 200°C/390°F. Halve eggplants lengthwise, score flesh crosswise and drizzle some olive oil on top. Roast for approx. 30 – 40 min. until soft. Then leave to cool. For the carrot salad, finely chop mint. Peel and grate carrots. Toast pumpkin seeds until fragrant. Toss grated carrots with chopped mint, toasted pumpkin seeds, cranberries, half of the cumin, some lemon juice, and some olive oil. Season with salt and pepper and allow to sit for 10 – 20 min. For the hummus, purée chickpeas with peeled garlic, tahini, olive oil, water, some lemon juice, the remaining cumin, and salt and pepper. Transfer to a bowl. For the eggplant dip, scrape out soft eggplant flesh and finely chop. Transfer to a large bowl. Make sure that the eggplant has a chance to cool before handling it. Now, finely chop thyme leaves and garlic. Add both to the eggplant mash together with some tahini, plain yogurt, and lemon juice. Mix until everything is well combined. Season with salt and pepper. 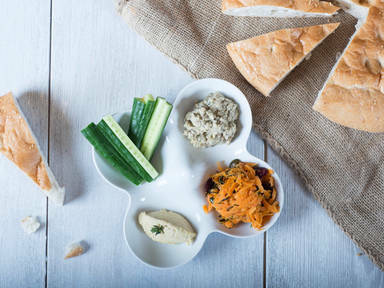 Enjoy the mezze platter with fresh vegetable sticks!